The longest tunnel in Brussels is closing for two months starting next weekend. Here’s what you need to know. Brussels’s Leopold II tunnel has been closed nights since 1 May for structural renovations. This has been little noticed by commuters, but that situation is about to change. The tunnel will close completely to vehicular traffic next Sunday and remain closed until the end of August. The Leopold II tunnel runs from the Basilique in Koekelberg all the way to Sainctelette. During May and June, works have been carried out overnight, with the tunnel closed from 22.00 to 6.00. It has to be closed round the clock for the other two summer months because asbestos will be removed from the infrastructure. There is much less traffic during July and August, but commuters are warned to expect delays. On Avenue Charles Quint – which leads traffic into Brussels from the E40 and the ring road – and on avenues du Panthéon and des Gloires Nationales, which circle the Basilique, there will be one lane open to regular traffic. A second lane will be open to busses and carpools with at least two passengers. This will be the case in both directions on those thoroughfares. Since 1 May, additional De Lijn buses have been assigned to these avenues, especially on weekdays. In addition, each side of the thoroughfares are separated by two bike lanes, one in each direction. Next week, when the tunnel closes completely to traffic, additional measures will come into force, including a round-a-bout at Sainctelette and a bus lane all the way to Sainctelette. In September, the tunnel will open to normal traffic. But the renovations will not be complete. The tunnel will also be closed during the summers of 2019 and 2020, with the traffic plan brought back. 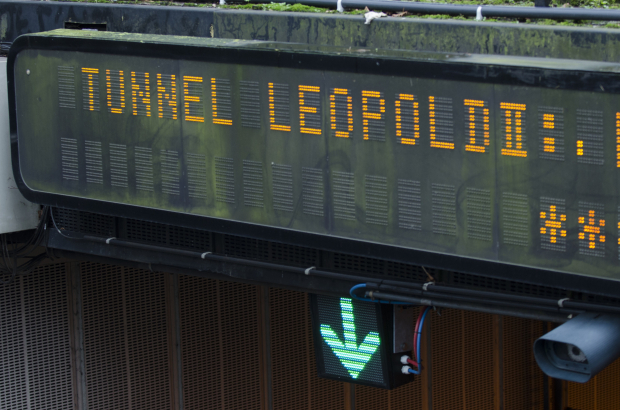 Leopold II is the longest tunnel in Belgium at just over 2.5 kilometres. Some 80,000 cars a day pass through the tunnel. The renovations cost a total of €282 million. Another €180 million has been made available for maintenance for the next 25 years.